The Lady Skater Pattern Tour is stopping here today. When Amanda of Kitschycoo contacted me about it I hastily signed up. 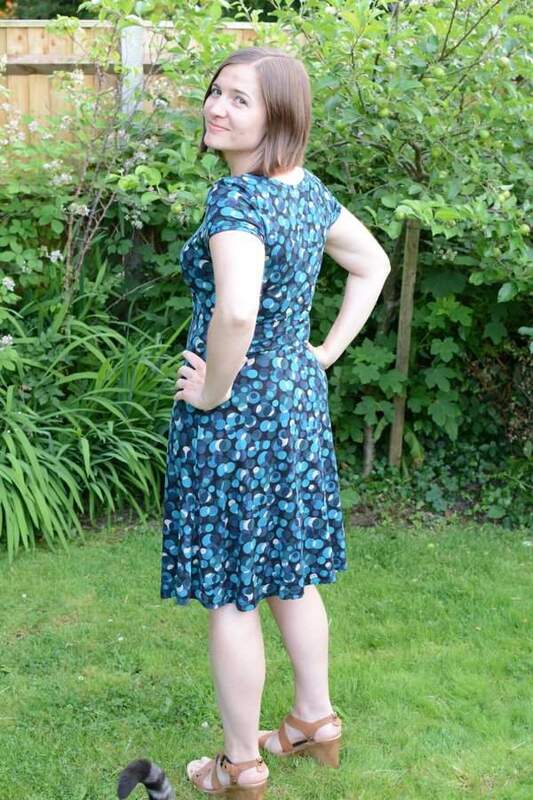 Then I realised that I’d have to include some photos of me wearing the dress. You see this is the very first thing I have sewn for myself. I’ve had plenty of plans to make things but this pattern tour finally gave me the kick up the bum to just sew something and the photos weren’t so bad after all, so thank you for asking me Amanda. The pattern has options for cap, 3/4 length or long sleeves. As we’re actually having a decent summer here in England it wasn’t difficult to decide on the cap sleeves. Cindy of Siestas and Sewing just showed off her lovely sleeveless version today. The pattern itself is fantastic. 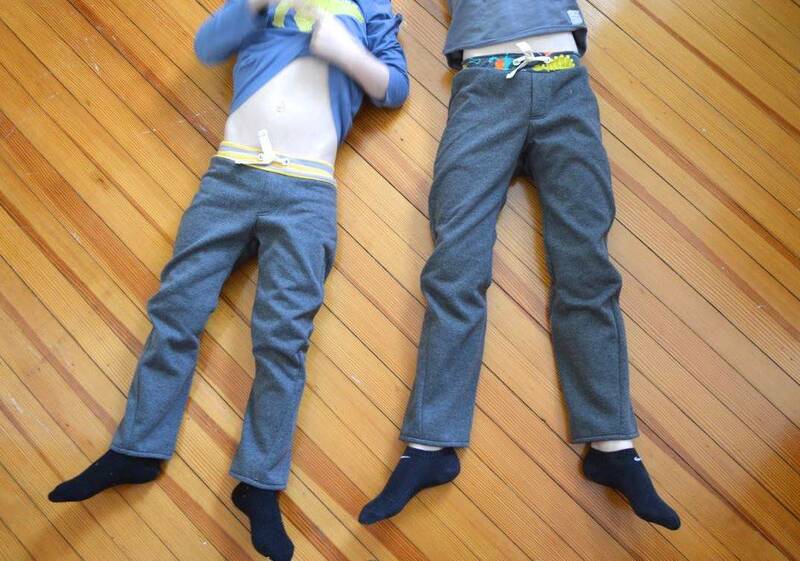 Amanda is a knit fabric guru and shares a lot of tips for sewing with them at the pattern. There is also a lot of advice on fitting, supplemented by some related blog posts that you can find here. 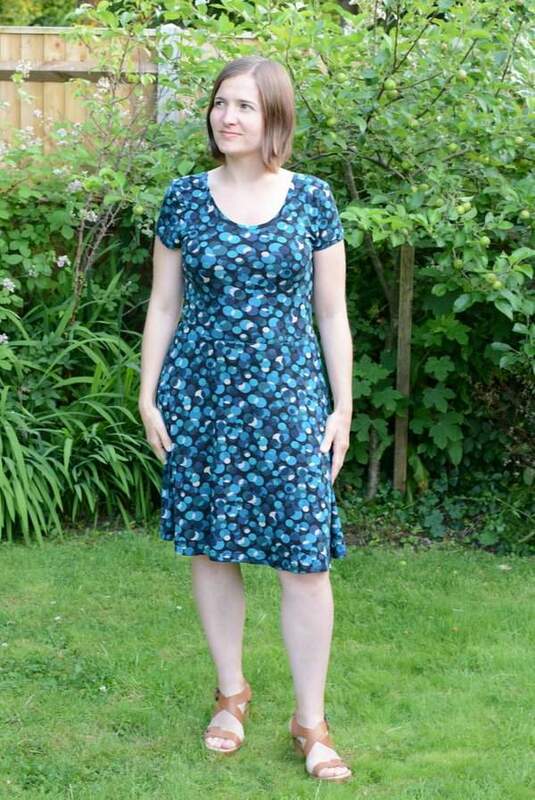 I had a different fabric planned for this dress, one that I bought in Belgium last year, but I couldn’t quite bring myself to cut into it despite making a muslin. So I wimped out and rushed to a local fabric shop to get something else. I narrowed it down to two options and Rowan had the final choice with this viscose and spandex blend – I think he chose well. I shouldn’t have worried about using my precious fabric though as the fit is great, so I already have another dress planned. Based on the muslins I shortened the bodice by an inch and could possibly have taken a little more off. To keep the overall length I then added 1.5″ to the skirt length. Other than those alterations I followed the pattern exactly. I am so pleased with this dress. It reminds me of the sort of dress that sold at Phase 8, which is quite a pricey shop here in the UK. My husband went as far as saying “you could actually wear this out”, high praise indeed. He did go on add how lovely it is. Casper gave it a thorough assessment, including an inspection of the back, and declared it a winner. If you’ve ever posed for blog photos then you’ll know it can be difficult knowing what to do with your arms. 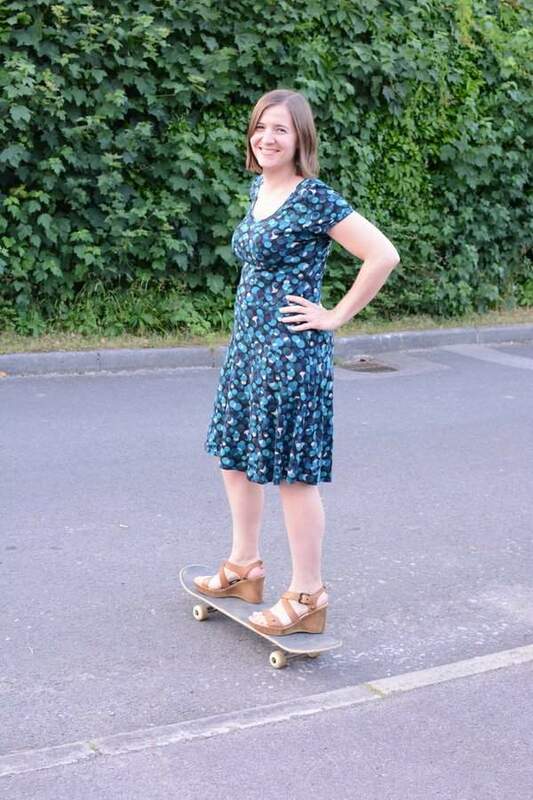 Well I found a solution – how about holding a skateboard? This is the Lady Skater Dress after all. 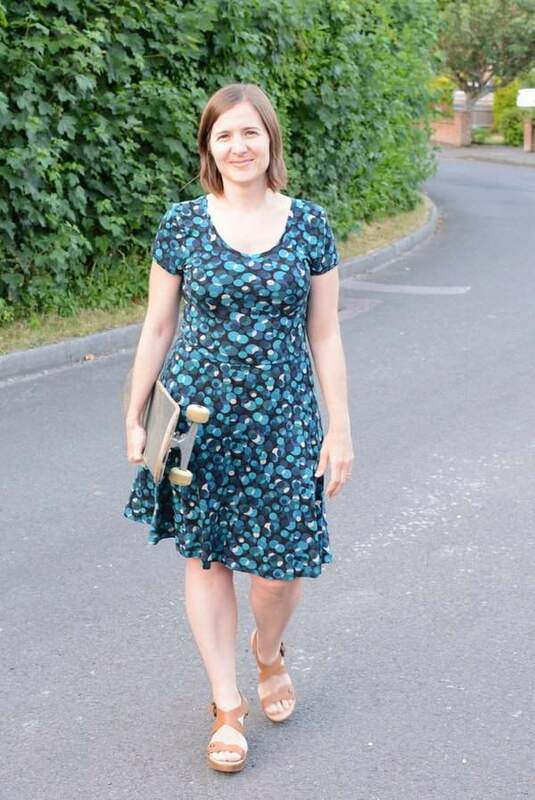 Of course, after that it was only a small step to standing on the skateboard – still with heels on though so no action shots. There have already been some amazing adaptions to the pattern on the tour so don’t forget to visit the rest of the tour. The Pattern is available here where there is also a Little Girl’s Skater Dress Pattern, as well as a lot of amazing knit fabric to tempt you. Disclaimer: I received this pattern for free but all opinions are my own. It looks so good (and comfortable!). Way to sew for yourself!! Ooh, it’s perfect! I love the “spur of the moment” print! It’s the perfect fit and so fun! I love flared from the waist dresses! Great job! Love it! Nice fabric choice and I think it really suits you. Looks very comfy too! Go Laura!! It looks amazing and you look amazing in it. Yay for being brave, I hope you’ve got plans to sew some more stuff for yourself now you’ve ‘broken the ice’ hehe. You look fabulous! I love this. The fit, the fabric, the shoes! Wonderful! It looks awesome Laura! Once I find the perfect knit fabric this pattern will be mine! I have a little bit of time before the weather heats up. Oooooooooooh! I wasn’t initially sold on this pattern, but it looks FANTASTIC on you! I want! WANT! Also, skateboard! Genius! Oh! WOW! way to go! The dress fits so perfectly. I can’t wait to see what else you make for yourself. The photos are awesome too- you look amazing.